This entry was posted in Authors, Events, Giveaways and tagged Nashville, Readers, Retreat by Carrie Turansky. Bookmark the permalink. Thanks Carrie for the shout out! We can’t WAIT to meet you!! *hugs! WHOOHOO!!! Thank you, Carrie! 😀 Cannot wait to meet you! 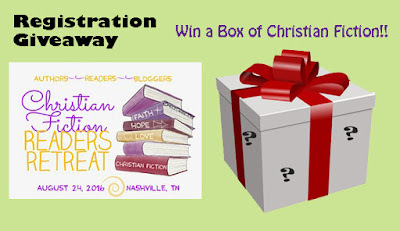 Thank you for featuring our Christian Fiction Readers Retreat, Carrie – we appreciate it so much! Carrie Schmidt, Annie, and I are beyond excited about the retreat – it’s the realization of a vision God gave and is now fulfilling. We are continually in awe at witnessing His hand in the planning and provisions provided. We’re a bit overwhelmed – and so grateful – for all the encouragement, support, and excitement from each of the authors participating in CFRR. Readers have a guaranteed time of laughter, fellowship with their fave authors and reader and blogger friends, joy, inspiration, music, prayer, and lifetime memories in store for them when attending CFRR – as well as food, chocolate, a swag bag full of “goodies”, games, author signings, and lots of giveaways. What could be more perfect? God is the master planner! Words can’t thank you enough for your support of, and contributions to – CFRR, Carrie Turansky!! I’m so looking forward to meeting you – blessings! !